Already upon opening in May 2015 it was certain the name presented as official is only temporary. After all, “New Bordeaux Stadium” is hardly imaginative. Negotiations with potential sponsors were long ongoing at that point and have now come to a close. Private operator of the stadium signed the deal with insurance company Matmut. 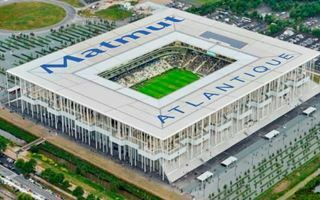 For 10 years the stadium will officially be called Matmut Atlantique. Why without any “stade/arena” part? Perhaps because for a few years the project has been referred to as Stade Atlantique and is France’s greatest sports venue throughout the western coast with 42,115 seats. Naming signage is expected to appear around the stadium soon. Largest logo will be placed atop the roof, while absolutely no signage is envisaged on the openwork facades. Instead, a tall totem pole will be placed close to the stadium, making its commercial name visible from afar. While the naming rights cannot include any Euro 2016 games, the sponsor will surely gain wide recognition as the stadium is already in the spotlight ahead of the UEFA tournament. Then come Girondins domestic and international games, most prestigious fixtures of rugby side Union Bordeaux Bègles and French national games. Nearest international game is scheduled for Sept 7, against Serbia.